Social media is the ultimate form of engagement and communication for business. It has radically and permanently transformed traditional marketing in B2B companies. You can’t shouldn’t attempt marketing without a social media presence. Yet it’s commonly known that the most trusted source of information is the employee. You can’t accomplish marketing without employees. Your employees are loyal to your brand. They desire to share you content. They want to work for an organization that inspires digital engagement. Your employees are also crafting their reputation in hopes of advancing their career. They may be envious of others who are professionally active on social media, but they simply don’t have the knowledge to engage in that manner. They worry that others will view them as a spammer or the annoying person who constantly promotes their own company’s stuff. These same employees worry about saying the wrong thing on social media or are concerned about getting fired for saying something against your company’s policy. 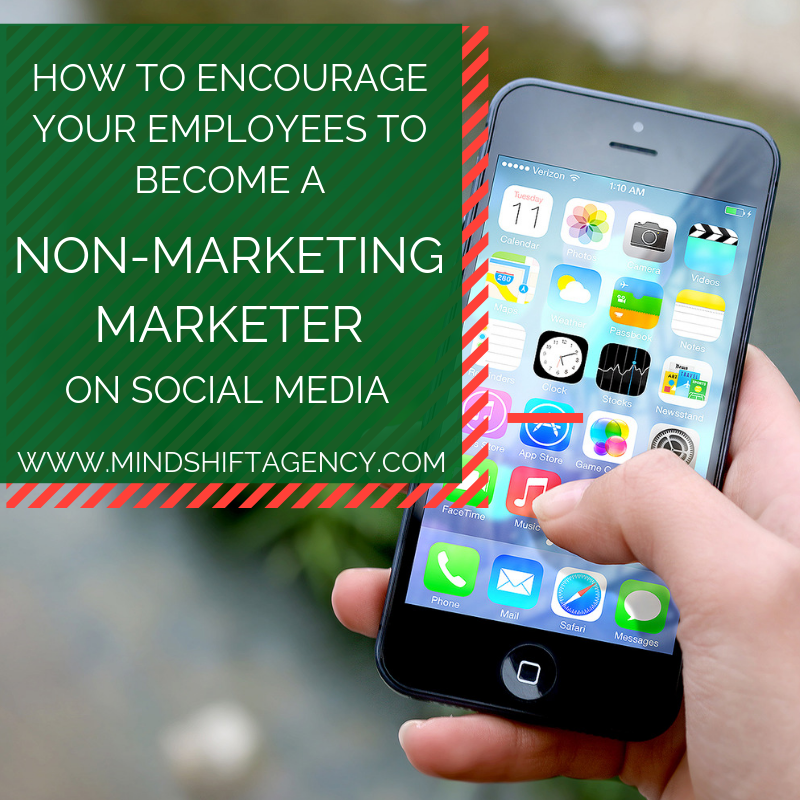 It makes sense that your employees will benefit from social media training if they already desire to to engage on social media. By providing this training, you’re investing in your people and preventing legal troubles. Mix a variety of online courses, digital resources, and live instructions to keep the training clear, helpful, and engaging. If you give a carpenter a hammer, he can probably craft something. Likewise, if you provide your employees with tools that make it easier and more convenient to engage on social media, they are more likely to engage on social media. Consider asking your marketing team to create a list of possible social media activities. This could include posting on LinkedIn, re-tweeting someone, following another business on Facebook, or sharing a social media post on their personal page. Then ask your marketing experts to find tools to make those social media activities happen. Perhaps this looks like adding shortcuts to employees desktops, using plugins online, or helping employees set up accounts. Keep in mind that these tools and social media participation are optional. Aside from your marketing team, you should not enforce this as a required activity! Besides, nothing encourages rebellion more than controlling demands. Once your marketing team has crafted a substantial list and researched how they can employ those methods, it’s time to educate your employees! Teach classes about the various types of social media platforms, share videos on how-to create an account and set up your profile, host webinars on how to connect with interesting friends or businesses, or offer engaging meetings to share your social media experiences. When equipped with the knowledge, your employees will find it easy, engaging and fun to be active on social media. Plus, they will feel qualified to share your company’s content and be aware of others in the industry. Have your HR team educate your entire company about what is and isn’t acceptable to say online. Express that each individual is the face of your company and an ambassador for your brand. Include sticky points, like not arguing with a follower in the comments of a post, or complaining about your product/coworker/boss online. This is also an excellent moment to review your company’s values. Remind your staff team who you are and what you can do for your customers. Let’s not forget a business truth: business is run by people, not logos or computers. People want to engage with real people. Did you know that your social media followers are more likely to engage with you online if your employees are involved? It feels more authentic, more natural, more face-to-face than a branded account. That’s because it’s actually real people, genuine employees who believe in your company and want to help this follower feel the same way. Marketing is always more successful when real people, like your employees, are involved. With the right training, tools and knowledge, your employees can be equipped as valiant representatives for your company via social media. The MindShift Agency is rooted in helping your business shift onto a path toward maturity and growth. If you employees need help becoming a non-marketing marketer, we can help establish that mind shift! Contact us so we can help your team get started today.